I’ve put on my imaginary flashing baubles for you. I think they would be fun but a bit of a nuisance, swishing backwards and forwards in the swell! I’d also have to turn the baubles off at night so I didn’t attract any hungry predators! All the wind and wave action means it’s been like a non-stop washing machine down here for weeks now, but that’s often how it is at this time of year. It seems to have kept my nosey visiting underwater photographer away too. Wishing you all a very Happy Christmas from Benny the Blenny and all in my underwater world. We’ve just had another storm, they’ve started giving them names now, this one was ‘Desmond’. The power of the waves has torn off a lot more kelp and thongweed (large seaweeds) from the rocks near my home. Some has ended up on the beach in large piles. Teresa has been wandering along the beach when the seaweed first washes up to see if she can find animals like sea mat, blue-rayed limpets and even raspberry sea squirts among the piles. A special surprise was that Storm Desmond has just brought in a lot of by-the-wind sailors (see photograph) up onto the beach too! They look like small jellyfish but each one is a colony of tiny animals called hydroids. The colonies’ sails catch the wind, propel them across the sea and give them their great name! Doubly nosy fish – I’ve got two sets of nostrils! It’s not just my head tentacles that go with the swell! The small tentacles (called cirri) around my nostrils swish around too when its rough. Have a close look at this photo; just over my lower nostrils you can see that I’ve got a little crown of these fine tentacles. They detect smells (chemicals) in the water as it flows into the nostrils. Before the water flows out again through my upper nostrils, it passes over a lot more sensitive cells that add to my knowledge of what’s around. Can you see my upper nostrils? They don’t have any tentacles, are just level with my eyes and look a bit like miniature volcanoes! My sense of smell helps me find food or a mate. It’s really important and takes over from my eyesight when the water is too murky for me to see clearly. You can also see several other little round holes on my head. They are either pores for drawing in water to help me sense what direction the good/bad smells are coming from, or are there to detect water movement. The water temperature is dropping slowly and its now 13 degrees. It calmed down for a couple of days last week and I was able to go out for a good hunt. I have to make the most of it when I can. It’s now turned incredibly rough again, well it is winter! 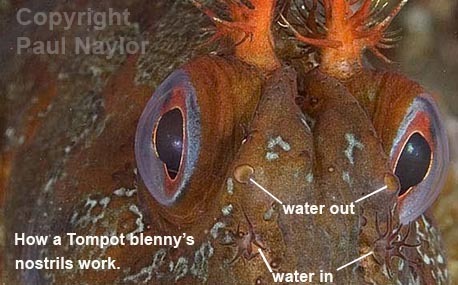 Author Benny the blennyPosted on 1st December 2015 2nd July 2016 Categories fishLeave a comment on Doubly nosy fish – I’ve got two sets of nostrils!